centres and operations monitoring centres. Sharing video wall signals on extended displays (e.g. cubes, LCD panels or monitors). And its output resolution is configured to match the native resolution of each display. Embedded with the Real-time Intelligent Exchange Transmission (RIET) technology, each signal is allocated to a dedicated high-speed data channel to achieve real-time transmission. Single chassis of Digicom HC5000 can drive up to 64 display units. Handles multiple resolutions from multiple sources including DVI, VGA, video, HDMI, DP, SDI simultaneously in real-time. Various combinations of input sources can be resized, overlapped and placed anywhere on the video wall. Multiple types of video walls or different configurations of video walls can be driven by one set of Digicom® HC50001 simultaneously, which greatly saves system cost and makes the system simple. Digicom® HC5000 supports to run a large static background in super high-resolution across the entire video wall that the saved graphics such as map and modelled building image can be recalled from the built-in Web control interface. Digicom® HC5000 is easy to maintain and expand because of its advanced modular architecture that all signal I/O boards and fans are hot swappable. The signal I/O boards are supported with instant image recovery after the modules are hot swapped. This feature allows the new modules to be replaced without disassembling the processor case or rebooting the video wall processor. Also, system expansion can be carried out by inserting additional signal I/O boards while the processor is running. Digicom® HC5000 is designed with intelligent temperature sensors which monitor air inlet/ outlet and core components in real-time. Also, you can check status information displayed on its front panel. 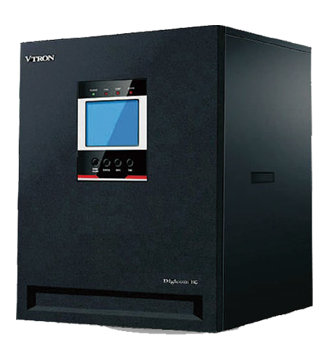 VTRON’s Digicom® Ark3000 series is a powerful video wall processor capable of driving up to 336 display units fulfilling all demanding 24/7 control room visualisation needs. 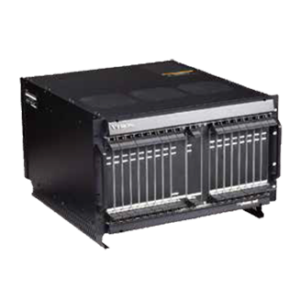 With bandwidth reaching n x 280Gbps and its Real-time Intelligent Exchange Transmission (RIET) technology, the Digicom® Ark3000 series supports real-time display. Featuring its genuine hot swappable processing boards and redundant power supplies and fans, the Digicom® Ark3000 series assures easy and minimum maintenance.